Are you upgrading your old Android phone to a new one? And what’s your new Android device? A Samsung S8/S8+, HTC One 10, LG G5, or Google Nexus 6P? No matter which one you got, you must want to transfer data, especially media files like sweet music and blockbuster movies, from the old Android to the new one. Take it easy. Here we are going to talk about how to transfer music and videos from Android to Android. Gihosoft Mobile Transfer is a professional software for cellphone data transfer between iOS and Android, Android and Android, iOS and iOS, and even from iTunes to iOS or Android. With it, you can transfer contacts, SMS, call logs, photos, music, videos and calendar from phone to phone easily. Download and install Gihosoft Phone Transfer to your computer. Turn on USB debugging on your two Android devices. Connect Android devices to your computer via USB cables. Run Android music transfer and tap “Phone to Phone”. The program will identify your devices and you will see an interface as shown below. You can click “Flip” to switch the source device and the destination device. Now, tick after the data your want to transfer, like music and videos. Then click “Start Copy” to begin the transfer. Endowed with powerful ability, Gihosoft can transfer media from Android to Android in a short time. Note: With Gihosoft Mobile Transfer, you can also transfer music from iPhone to Android or transfer music from iTunes to Android. Android OS is popular around the world, mostly because it’s a greatly open platform. People can get access to an Android phone’s memory easily through computer. 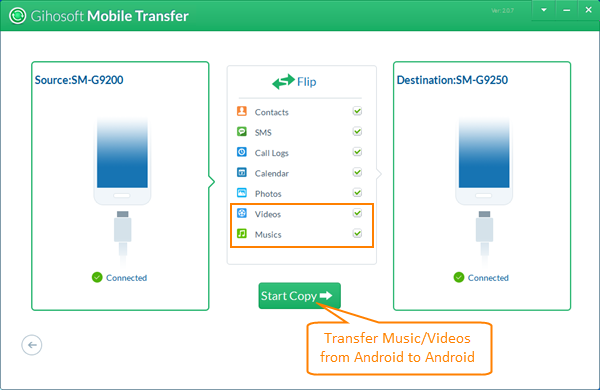 In this way, people can transfer songs from Android to Android by drag-and-drop, as well as videos and other media files. First of all, connect two Android devices to computer via USB cables. Take it in mind that the USB cables should work for data transfer, not just for charging. Next, when the computer identifies your devices, double click “Computer” icon on your computer desktop and find “Portable Devices” on the new page. Double click devices icons. If you can’t find “Portable Devices” there, check and make sure your devices are connected to computer as media device (MTP). Then, you will see Android phones’ internal storage directory and SD card directory (if there have SD cards on your phones). Your songs are usually in “Music” folder, and videos usually in “Video” folder or somewhere like this. Finally, open music folders on both the old Android and the new Android, select the songs you want and drag-and-drop them from the old Android to the new one. You can transfer videos or other data in the same way.